Chattel loans finance the mobile home as a piece of personal property, rather than as real estate. As a result, the interest rates on these loans are typically much higher than what a mortgage loan would command. This leaves the homeowner with a hefty monthly payment and lots paid in interest over the life of their loan. One way mobile home owners can lower these costs is through refinancing—specifically, refinancing their chattel loan into a mortgage loan once the property is eligible. Refinancing into a mortgage loan can take some work, but it can mean significantly lower interest rates—not to mention overall costs—for the remainder of the loan’s life. In general, chattel loans have rates anywhere from 7 percent to upwards of 12 percent. At the start of 2019, rates on 30-year fixed mortgage loans were under 4.5 percent. There are some exceptions to these rules, which we’ll get into shortly. In most cases, the biggest challenge with refinancing a mobile home is converting the home’s personal property title into a real estate title. In some states, there are clear-cut processes for how a personal property title can be converted into a real estate title, with very specific rules for what constitutes real estate and what doesn’t. In other states, it may be more complicated. After the title company has converted the title, you can then start shopping around for mortgages. You’ll want to focus on lenders who specifically offer loans on mobile and manufactured homes. Not all mortgage companies offer these. Though it is much easier to get a real estate title—not to mention a mortgage loan — if you own the land your mobile home is placed on, there are exceptions to this rule. If you lease your lot in a mobile home community or from some form of landlord, then you might still qualify under the Federal Housing Administrations Title 1 program. The Federal Housing Administration has very strict standards for mobile home communities, so make sure you choose yours (and your landlord) carefully if you’re considering a Title 1 mortgage loan. 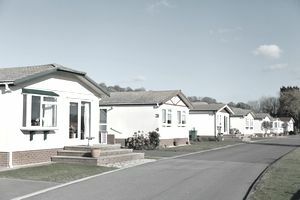 There are several costs associated with refinancing your mobile home with a mortgage loan. For one, there are taxes to consider. Personal property taxes and real estate taxes vary, so depending on your state, you may owe more (or less) once you convert your title. You will also have costs to originate your mortgage loan, and there will be a down payment, closing costs and other fees, too. These will depend largely on your lender and the unique fees they charge per loan. Because converting to a real estate title requires a permanent foundation, you also may have this cost to factor in as well. An affixed foundation can cost $10,000 or more, depending on the footprint of your home.